Internet traffic is becoming more and more important since the company you are working for is focused on e-commerce. Every minute that their webservers running webshops are unavailable is causing profit loss. The company decided need a scalable solution and get rid of the single router (NewJersey), so there is no single point of failure anymore. Up to you to start configuring! The host router has been configured with “no ip routing” which will turn it into an ordinary host. OSPF has been configured on all routers except the host router for full connectivity. Configure NewYork, Newjersey and L.A. for VRRP, use the group number “1”. The virtual IP Address should be 192.168.1.254 /24 . Newjersey should be the master router, when it fails L.A. should take over. Hello packets should be sent every 7 seconds. Make sure the router with highest priority will always be the Master router. Configure authentication for VRRP, use password “vault”. When the HSRP active router’s F0/1 interface goes down, make sure it’s no longer the master VRRP router. Configure the virtual IP address of VRRP as default gateway on the Host Router. Ensure you can ping the loopbacks of the ISP router from the Host router. Ensure that whenever 2 out of 3 routers are down, the Host router still has connectivity to the ISP. 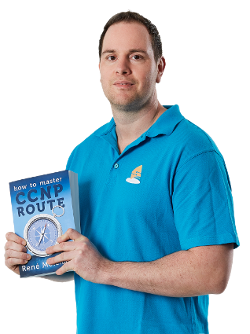 It took me 1000s of hours reading books and doing labs, making mistakes over and over again until I mastered all the routing protocols for CCNP. Would you like to be a master of routing too? In a short time without having to read 900 page books or google the answers to your questions and browsing through forums? I collected all my knowledge and created a single ebook for you that has everything you need to know to become a master of routing. 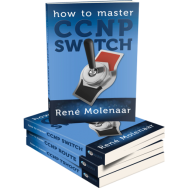 You will learn all the secrets about VRRP, gateway redundancy and more. One precision concerning this lab… Do i understand correct that to configure VRRP on CISCO firstly we should configure HSRP? I’ve configured VRRP and i can ping ISP with 192.168.2.254, but can’t ping with loopback ip addresses, is it normal? If you are able to ping the 192.168.2.254 IP address but not from a loopback you have some routing issues. See if the ISP router knows about the destination network where you are sending the ping from. If not you’ll have to add some static routes or additional network commands for OSPF. I think the command "ip ospf network point-to-point" should be issued on the loopbacks so that ospf will consider them as normal interface to be advertised with the exact subnet. it worked for me and ospf domain saw them as /24 networks. Thank You.. It was helpful !!!! But may I make a suggestion. 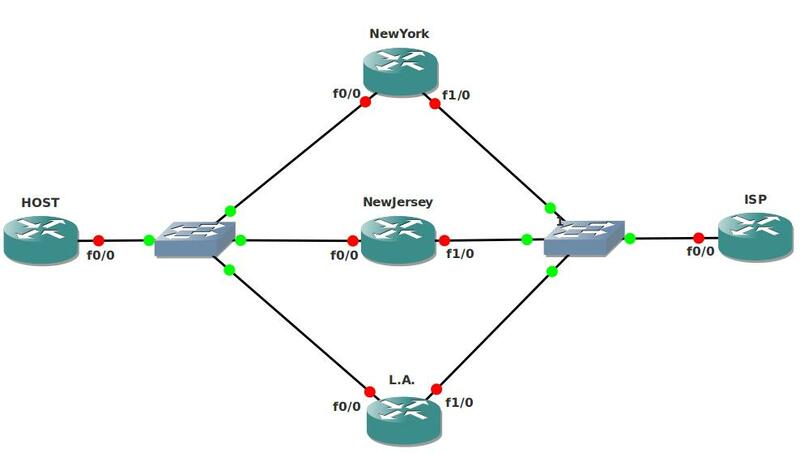 If you want to see the host’s pings fail as the master router’s priority decrements and the backup takes over that role, then you should ensure that interface fa0/0 on New York, New jersey and LA are not forming adjacencies on those interfaces.In other words make them passive. I think this is a nice way to see how long it will take for the routers to fail over from the host’s point of view. This lab is not right no more.. something probably happened. I am doing troubleshooting and then VRRP. I wasn’t expecting that.. found so many misplaced configuration and neighboring with routers that don’t even are in the topology. There is an error on the host config. Interface fa01/ has the IP address on but FA0/0 is connected to the switch. If you ping from Host to ISP when you have shut both LA and New Jersey you get some U.U.U responses before New York router becomes a full Active route. Did you mean to include the initial configurations/topology files on this page? It sounds like it based on the wording of the instructions. I am trying to open this vrrp lab. can anyone plz help me with my gns3. Me too. Can’t open the vrrp lab. There is no gns3 topology to open. Plz, in Topology as you write a interfaces of routers and switches, i request you to write IP address to so that we can understand much better ! This might be a new GNS3 thing, but I am not sure.